It’s the EGOT of the toy world! On October 1, the National Toy Hall of Fame announced the 2013 finalists for induction into the hall: bubbles, chess, Clue, Fisher-Price Little People, little green army men, Magic 8 Ball, My Little Pony, Nerf toys, Pac-Man, rubber duck, scooter, and Teenage Mutant Ninja Turtles. Only two lucky toys will join the prestigious list of hall of famers. Although a national selection committee will choose the 2013 inductees, you can cast your vote in the public poll. So far, the 1980s toys are the front-runners… gnarly dude! Don’t see your favorite toy? Then submit a nomination for 2014. But first, make sure your nominee passes the hall’s rigorous set of criteria: the toy must be widely recognized and respected; it must have longevity, having been enjoyed by generations; it must foster learning, creativity, or discovery; and it has to be innovative, having profoundly changed play or toy design. Does your favorite toy have what it takes? This boxy bathing beauty doesn’t look much like your typical doll—she’s equipped with a key-wound, spring-loaded mechanism that allows her to actually do the breaststroke! 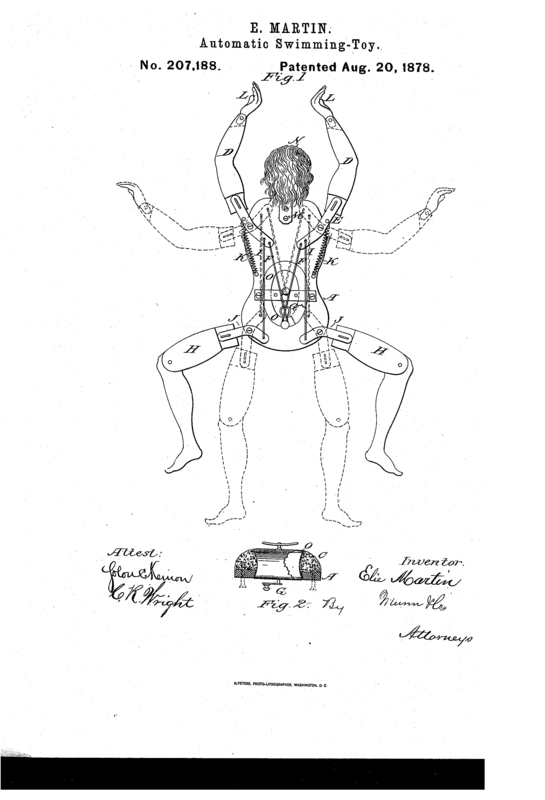 Patented in 1878 by E. Martin, Undine, as she was named in the patent, probably wasn’t meant for children. Fanciful mechanical toys such as Undine were likely too expensive for child’s play and were instead used as a form of entertainment for adults during parties. While we don’t think she crossed the English Channel or won any medals for swimming in the 1896 Olympics, this Victorian mechanized swimming doll is certainly a noteworthy gal. Want to see Undine race Missy Franklin or Michael Phelps? We do too, but unfortunately she hasn’t been wound up in quite some time. We did, however, find some modern takes on the swimming doll — no winding required — she takes AAA batteries and has a built-in sensor! Like many miniature artists, Pete Acquisto transferred his skills in a full-scale craft (for him, jewelry making) to miniatures. After selecting and researching classic antique silver styles and forms, he uses casting to create each work. He likes to choose increasingly difficult pieces, such as this samovar, or beverage dispenser, in the T/m collection. Samovars were used in Central and Eastern European countries to heat water for tea. Can’t imagine how someone can make something so intricate, so small? Check out this video from the Mini Time Machine Museum of Miniatures to hear Acquisto talk about his work. Then, see more of Acquisto’s miniature reproductions of antique silver in 1:12 and 1:24 scale online at the Acquisto Gallery of Fine Art. Have you heard of Caine’s Arcade?! This little boy’s imagination not only created an awesome cardboard arcade, but sparked a movement, and a foundation, to foster creativity and entrepreneurship in kids. The Imagination Foundation’s second annual Global Cardboard Challenge aims to engage 1 million kids in 70 countries in creative play. What will you make out of cardboard on October 6? After his TEDxTeen talk, Caine is moving on to his next entrepreneurial project: Caine’s Bike Shop. But no fear, TOMS Shoes, in partnership with the Imagination Foundation, is taking Caine’s Arcade on the road. We’re looking forward to seeing where Caine’s imagination takes him next! What little girl wouldn’t want a doll made to look just like her? American Girl Dolls can be customized to match their owner’s hair, eyes, skin tone, and even hobby (gymnastics anyone?!). While ordering dolls online may be a 21st century idea, custom-made dolls are a trend straight out of the Victorian Era. 19th century doll artist Izannah Walker began creating hand-painted cloth dolls in the 1840s. By 1873, she patented her process for doll construction, which covered molded fabric with paste. Walker’s dolls were an unbreakable counterpart to the popular china or bisque dolls of the time period. As you can imagine, these dolls were often well loved, so many of them haven’t survived. We’re lucky to not only have Miss Mary in our collection, but also a photograph of her and Mary Estelle Newell, the doll’s original owner—and in matching outfits no less!